UWTSD has had a long and fruitful partnership with the Muslim Council of Wales. Click here for the last colloquium page. Click here for the MCW colloquium report. We are a not for profit organisation, head quartered in Cardiff City and have projects designed to enhance the quality of life for Welsh Muslims, build community cohesion and encourage active citizenship. 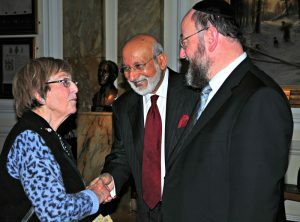 The Muslim Council of Wales was founded in 2003, as an affiliate to the Muslim Council of Britain, to reflect the devolved structure of Welsh government as well as the unique historical, social and religious context of Wales. Below is our Declaration of Intent which guides our work. It is an independent body working for the pleasure of Allah to promote consultation. Cooperation and coordination on Muslim affairs in Wales. It is a none-sectarian body working for the common good without interfering, displacing or isolating any existing Muslim work in the community. It is a broad-based representative organisation of Muslims in Wales, accommodating and reflecting the variety of social, cultural and theologicals backgrounds of Muslim communities.e) It is a body that will base its policies and decisions on consensus (shura) and the largest practicable measure of common agreement. It is a formally constituted body with a system of representation and accountability. To promote an accurate image of Islam and Muslims in Wales. We believe it is necessary for Muslims to be proactive in representing the true message of Islam and its teachings. To encourage and strengthen all existing efforts being made for the benefit of the Muslim community. To work for a more enlightened appreciation of Islam and Muslims in the wider society. To establish a position for the Muslim within British society that is fair and due rights. To work for the eradication of disadvantages and all forms of discrimination faced by Muslims. To foster better community relations and work for the good of society as a whole. To broaden and encourage intergration between Muslims and non-Muslims to ensure the creation of a strong and cohesive Welsh society. To present an Islamic perspective on issues of importance to the Welsh public. In offering that perspective, we seek to empower the Muslim community in Wales through political and social activism through the following methods.